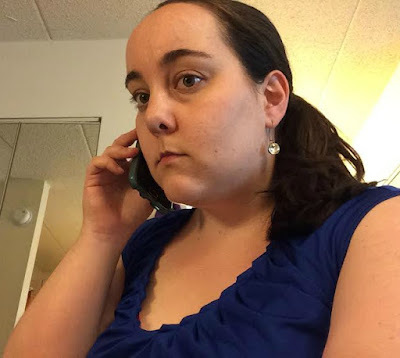 *Disclosure: I received a free meal at Pie Five to facilitate this post. The opinions expressed here, however, are my own. 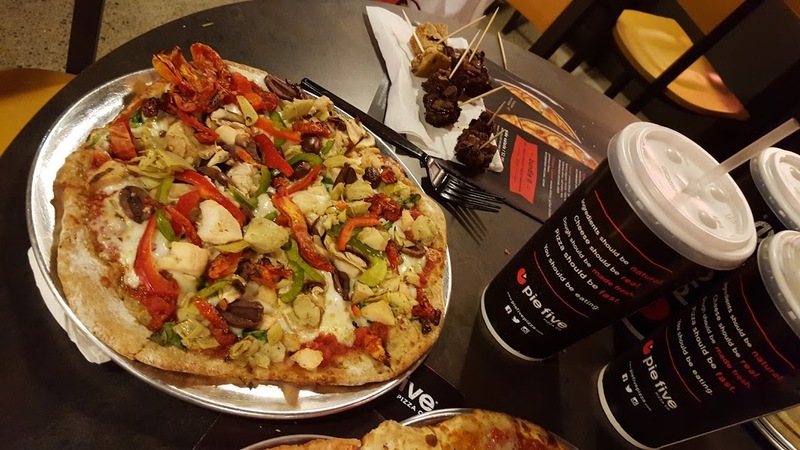 This past Monday night, my parents and I headed to Pie Five Pizza in Southfield for a blogger event to try out its pizzas. I'm no newbie to the "fast pizza" business - I've tried out both Blaze Pizza (Royal Oak, Novi) and MOD Pizza (Northville, Livonia, and soon Rochester Hills) - but I've been wanting to try out Pie Five for a while now, so I'm glad it held this event. Before we got in line, the restaurant brought out a few of its signature creations for the bloggers to try. I tried a slice of the Farmer's Market pizza (tuscan marinara, mushrooms, red onions, spinach, red and green peppers, roasted tomatoes) as well as the Tuscan Chicken (olive oil, sun-dried tomatoes, minced garlic, spinach, grilled chicken). I liked the Farmer's Market pizza a little better, surprisingly, but the Tuscan Chicken one was also good. 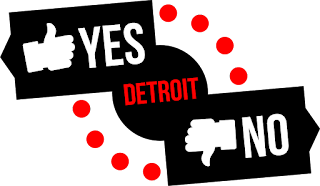 Ultimately, I ended up doing a "make your own creation" pizza, which is $6.99 at the Southfield location; a little less expensive than Blaze or MOD, but the crust is a bit more personal-sized, as well. You start off with your crust choice: artisan thin, classic pan (kind of in-between a regular pizza crust and Chicago deep dish pizza, IMO), whole grain thin, or gluten-free; add $2 if you choose gluten-free. You then choose your sauce and toppings. 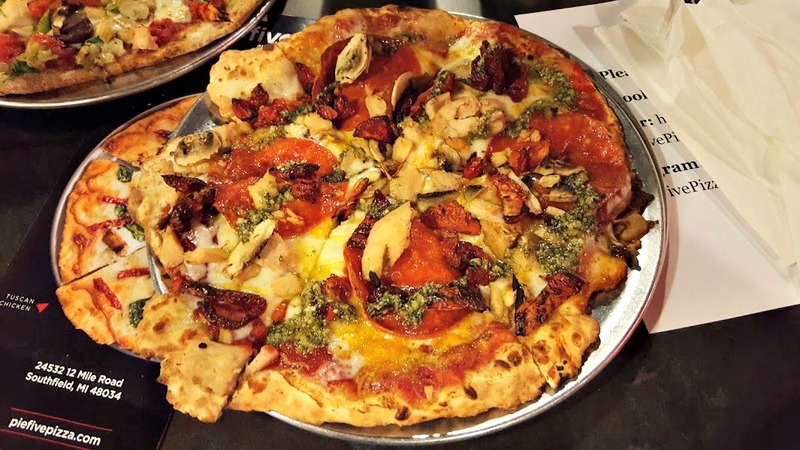 I chose the artisan thin crust, and added "Tuscan marinara" sauce, mozzarella AND cheddar cheese, pepperoni, grilled chicken, mushrooms, minced garlic, sun-dried tomatoes, and a pesto swirl at the end. Sun-dried tomatoes are my favorite so that was a nice surprise to see that Pie Five had that. 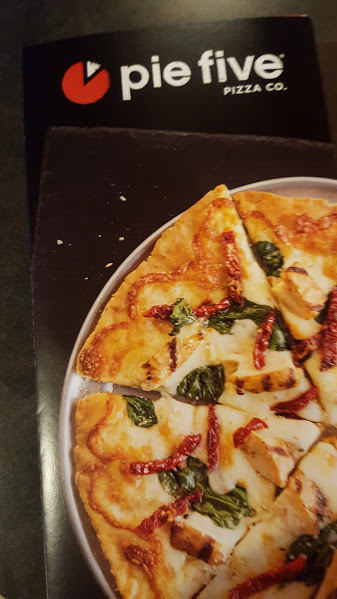 My pizza was overall tasty, but I think next time I'd actually get rid of the garlic and cheddar cheese - with the pesto swirl, it was a little overwhelming. We got to try a few of the dessert pies, too - it has Turtle Brownie, Ultimate Brownie, and Chocolate Chip - and those were DELICIOUS. A slice of those retails for $1.69, too, which is definitely not expensive, and I want to get one next time I go there. 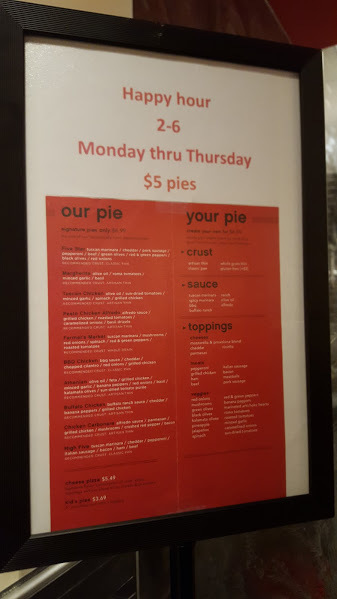 This Pie Five location also does a happy hour, from 2-6pm Mondays through Thursdays, where all pies are $5 - also not a bad deal. The Maple Theater is right up the street, too, so I could see stopping by Pie Five before a movie screening and grabbing one of those $5 pizzas. 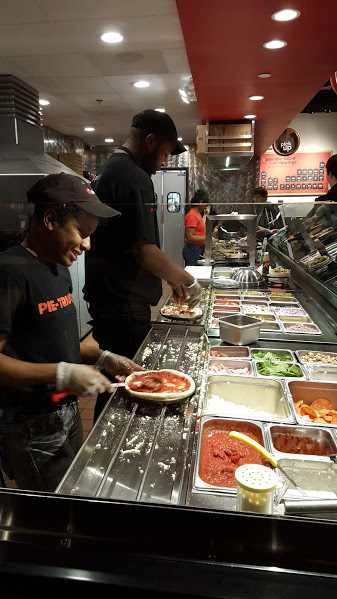 I enjoyed my pizza at Pie Five and will be back sometime soon to try a different make-your-own creation. 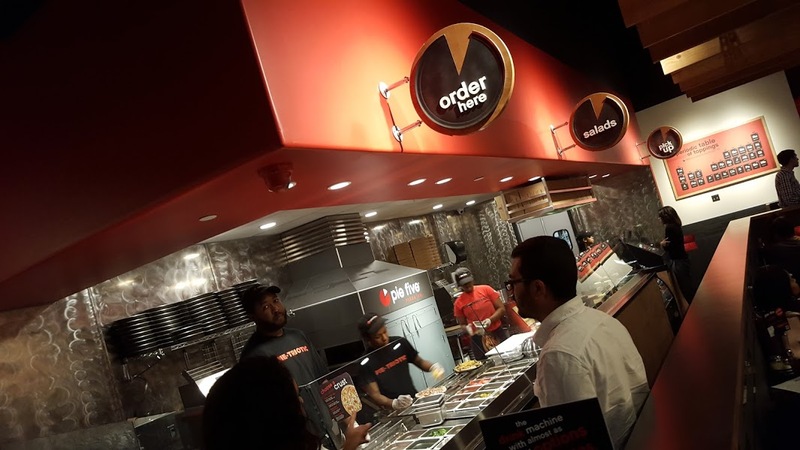 I liked that it had a choice of crusts, which its competitors do not, and that it has a wide selection of pizza, salads, and dessert pies. My only suggestion to the restaurant would be to add more cheeses - Blaze has this ovalini mozzarella which I adore - and to maybe make its pizzas a little bigger; however, I liked that I still had leftovers for the next day, too, and that its crust was crunchy rather than soggy, even with all the toppings. 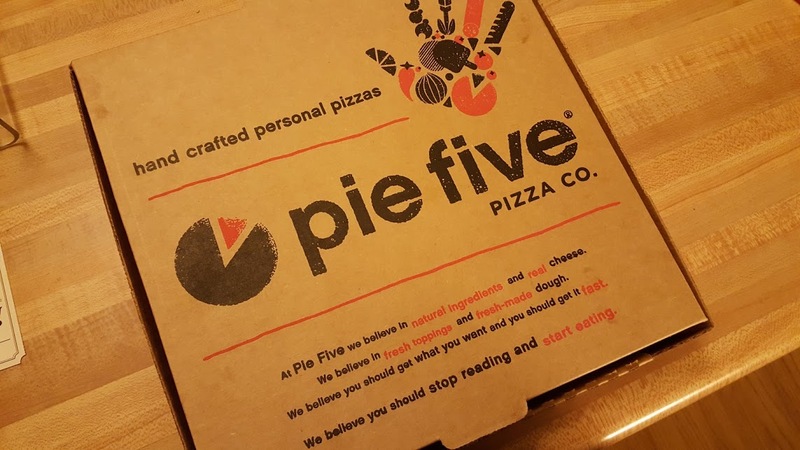 Do you have a Pie Five near you and if so, have you tried it out yet?